Although I’ve had issues with mobility my whole life, recent changes with my health have made attending festivals a lot more difficult. In 2016 while working at Enchanted Forest Gathering, a friend came up to to me for a hug. Before I knew it, I was tumbling to the ground almost taking her down with me. Over the next few months I noticed my balance getting worse and walking became very difficult. One of the things that scared me most was the idea that I wouldn’t be able to attend festivals anymore which had become very special part of my life. By the summer of 2017 there had been a lot of ups and downs, and even though I had made some overall improvement, I was a long way from being able to walk on uneven surfaces or anything but short distances. I was able to attend events, but only with the combined help of a wheelchair and a ton of support from my friends. This was incredibly challenging at times, and at others powerfully rewarding. After a while, I realized that some of the biggest lessons I had learned in my previous years of attending festivals were even more relevant now that I was facing lessened mobility. 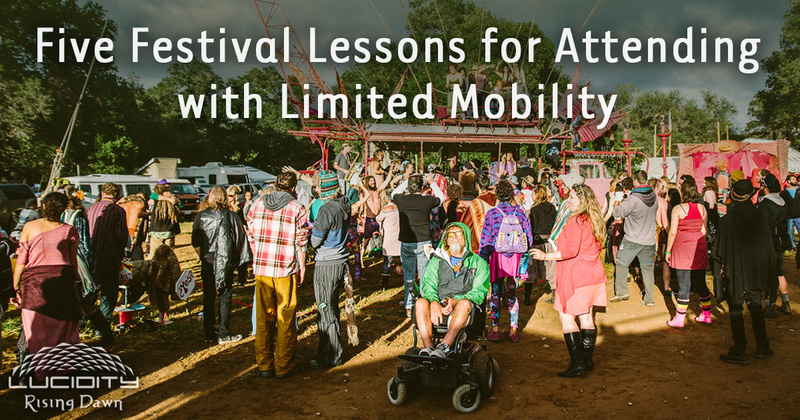 While I don’t expect these to apply to every person and situation, I’d like to inspire anyone with mobility challenges who would like to attend Lucidity (or any festival) that it is possible! Self care is the biggest festival tip I can think of, for everyone attending. Festivals are hard on us, physically and emotionally, so it’s important to treat yourself as well as you can. Bring healthy food that’s easy to eat and doesn’t require much preparation. Drink lots of water and electrolytes. Bring extra blankets and pillows to help you stay warm and cozy. This doesn’t mean don’t have fun, but balance the fun with self care and you’ll be able to do twice as much! This is even truer if you’re attending festivals with a disability. If you have additional needs, you likely know what they are. Bring whatever you can to aid you, even if it seems impractical. When the idea of a wheelchair was first floated to me, I initially felt pretty resistant. I ended up being so thankful to have one there because it allowed me to see and do much more than I would have otherwise. If possible, take advantage of healing services offered at events. At Lucidity, you may find needed relief and care to help make your experience more comfortable at I AM Healing. Even in the best situations, having mobility issues at a festival has its moments of frustration. I found it really helpful during these times to embrace the flow, something I’m not particularly good at in the default world. I learned acceptance of the situation and recognition that what was most important to me was being in a beautiful place with my amazing festival family. This helped me relax into the situation and come to peace with the frustrations. Small reminders of gratitude can generally be found even at difficult times, and it helps put you in a more calm state, which can also reduce pain. Try and write some of these down or mention them to others, it makes them more powerful and overrides whatever frustrations you may be experiencing. 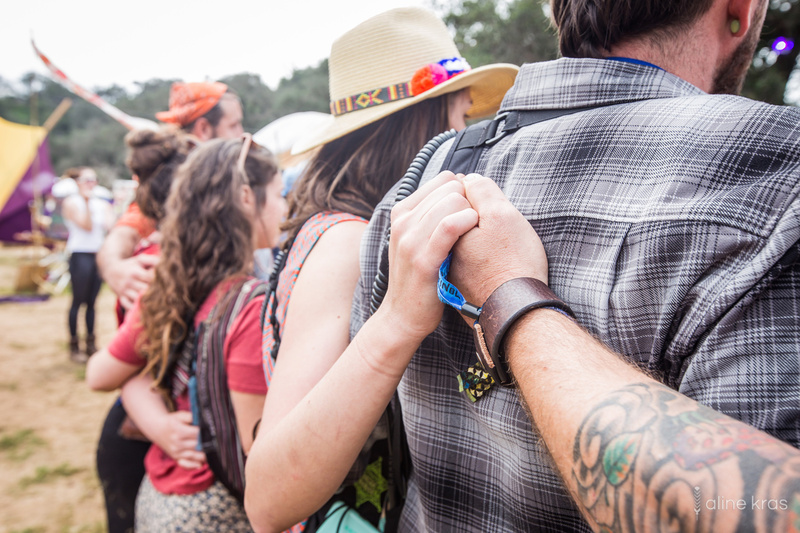 Festivals couldn’t exist without the power of community. From the larger community that creates the event, to the communal groups of friends who travel together to join in the fun, coming together is a big part of festival culture. Communities should be made up of strong individuals who also have the ability to work together and help each other out. Asking for help doesn’t make you a Sparkle Pony! Self-reliance is a great skill to practice, but don’t forget that everyone has their own limitations and abilities. Needing assistance doesn’t mean a person is insufficiently self-reliant. You can need the support of others (we all do) and practice self-reliance within your capabilities. We are stronger when we work together. Communication is always useful. Especially when you have needs that others may not automatically understand or see, it’s imperative to speak up. Unfortunately as amazing as your friends may be, mind reading is unlikely an ability they have. You’ll have a lot more success communicating your needs, or even things you don’t need. This conversation can begin before you even leave for an event. Clue people into what you might need, or ways of letting them know now is a time to help out, or to leave you alone. A lot of people you haven’t met at a festival can be really helpful too, and Lucidity’s staff is always happy to assist you. Communicating about your needs is hard, I can only do it sometimes myself, but this is a really good opportunity to practice with a safety net of good friends. 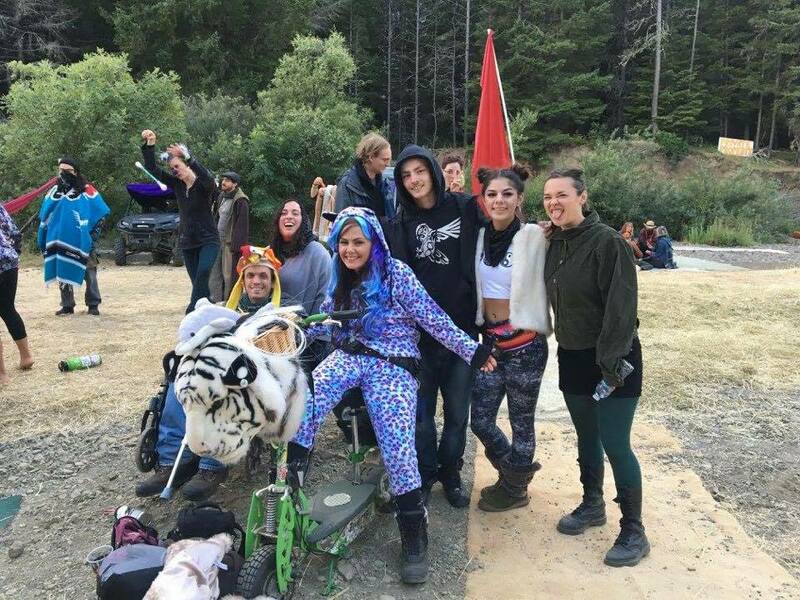 Get in touch with Lucidity’s ADA Team to request an ADA Car Camping pass, arrange for assistance or inquire about ADA facilities by sending an email to info@lucidityfestival.com. I’ve had great times at the hidden gems of a festival, located away from the main stage and possibly closer to camp, those tucked away corners you notice more when your pace is slower. 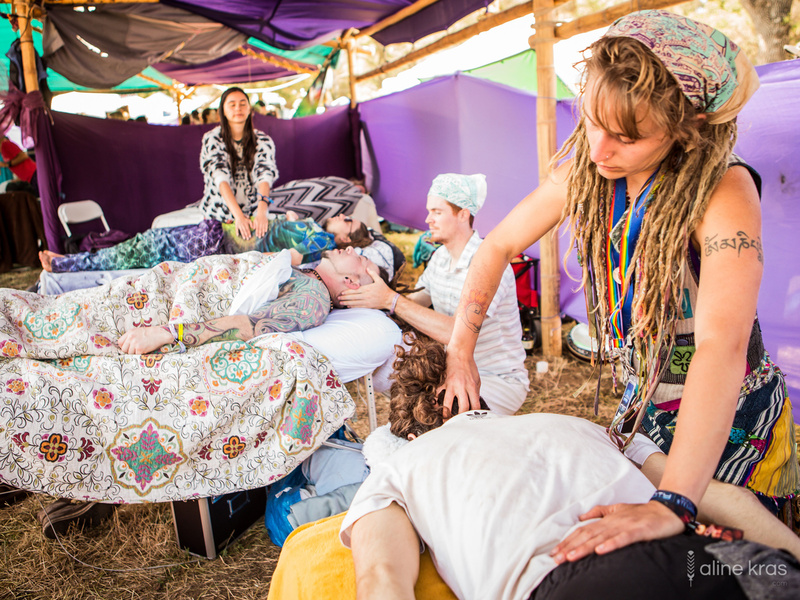 You’ll find everything from side stages to theme camps, workshop areas, and healing spaces. These areas can be a bit quieter, provide areas to sit, and have less overwhelming crowds. Lucidity has many such environments tucked into the Elemental Realms of the festival, which are great places to meet like minded people, rest between adventures, or take in the event from a different view. You can take this one step farther by decorating your home base and finding ways to bring entertainment to your camp. This makes your self care time more festive. Ideas for this include comfy chairs, squishy pillow lounges, personal stereos, games, and colorful lights which can also provide more visibility at night and make it a little easier to navigate camp. Create a theme for your camp and collaborate with your friends on decorations! By planning ahead, traveling with friends who have your back, and communicating your needs ahead of time and at the event, even those with limited mobility or disabilities can enjoy a transformative and healing festival experience. And do let Lucidity know if there’s any way we can better support you. Gettin’ by with a little help from his friends, Zac (in the chicken hat) and crew at Enchanted Forest.